At Southeastern Occupational Pulmonary Services, PLLC, we understand that occupational lung diseases are serious and complex. We have over 19 years experience in the evaluation of occupational lung diseases in the workplace. 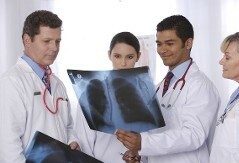 We also perform pulmonary independent medical exams (IME). These are thorough, objective, and honest evaluations, performed in a timely and professional manner by a board-certified pulmonologist. We can work with attorneys, workers compensation carriers or with employers directly to assure an accurate, unbiased, and complete evaluation. We offer industry clients guidance with establishing lung preservation and/or lung monitoring programs. We can assist with educational services on a variety of topics pertaining to pulmonary diseases in and out of the workplace. We partner with Industrial Medicine Solutions, LLC with providing education in various occupational medicine topics. Contact us in Knoxville, Tennessee, and see if we can help your business with employee lung issues. Hours of Operation: Evaluations performed by appointment only. We are not a walk-in clinic. We do not see medical or pulmonary (breathing) emergencies. 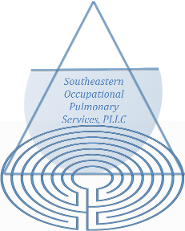 Southeastern Occupational Pulmonary Services, PLLC is located in Knoxville, Tennessee. We provide services pertaining to lung heath in the workplace. Our providers do not perform long-term follow up of patients. After an evaluation, continued follow up remains the responsibility of the employee's health care providers. We are available to the employee's health care providers as a resource if needed. Lung evaluations address non-emergent lung injury in the workplace and Independent Medical Evaluations of work-related lung disease. The information in this website is intended for information purposes only. It should is not intended to serve as a substitute for the advice and treatment of a health care professional. We are committed to serving our client's needs, and evaluate patients in a timely, professional, and compassionate manner. We are HIPAA compliant with respect to medical evaluations, records and management of personal health information (PHI). **We do not see medical or breathing emergencies. We are not a walk-in clinic. All appointments are by appointment only. Appointments must be made by employers, workers' compensation carriers, or law firms. Proud Supporter of the American Cancer Society and The Chest Foundation.